Fairmont le Chateau Montebello will always have a special connection to the National Trust, the hotel is on the same property as Papineau Chapel, a property we have operated since the 1970s. 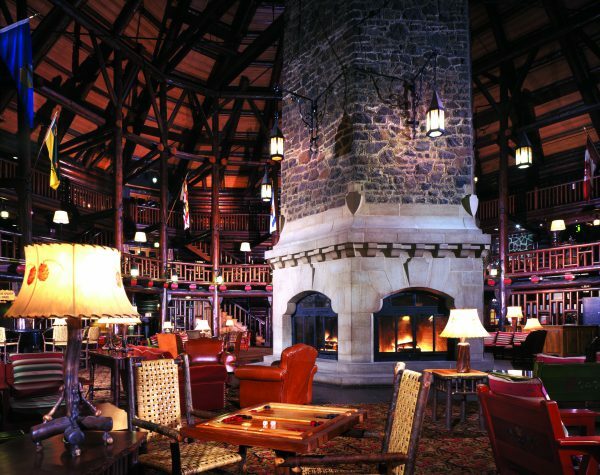 Now, Chateau Montebello will have another special connection with me; it will be remembered as a place where my husband and I had the MOST winter-time fun, ever. As soon as you pull into the wooden gates by the main road, you know you are entering a Vintage Destination. It has that vibe, the sense of history, and it is also a beautiful winter wonderland. You know it is a place where you are going to check your phone less and be able to disconnect. My husband, Aaron, is a woodsy-type guy and loved that this was a luxury hotel, but it still felt like a cozy log cabin. When you first walk in you see the most beautiful five-sided fireplace, and of course Monte’s dog house. Side note: Monte is the resident dog at Montebello and is the sweetest dog you’ll ever meet. It is incredible to think that in February 1930, the site was simply a clearing in the woods. Just four months later, the largest log chateau in Canada was completed. It was late afternoon when we arrived so we left our bags in our homey suite and headed to quickly explore what was onsite. We walked around the grounds to explore some of the walking trails, the rentals building, (where you can catch a dog sled or horse drawn carriage), and the two outdoor hockey rinks. We also found (okay, I admit I knew it was there and just wanted to give Aaron a history lesson), the Manoir Papineau, a Parks Canada historic site. I gave him the quickest history lesson I could and a rundown of how the Trust is involved in the site with Papineau Chapel. We walked 10 minutes down the trail, all the while retelling the Papineau family story, to the funeral chapel of Louis Joseph and his family. My former tour guide self, loved telling Aaron about the history of the place, how the seigneurial system worked in French Canada, and why I love the rebel that was Louis Joseph Papineau. When we got back we were quite hungry, and because I have dined in the formal restaurant (Aux Chantinoles) before, we opted to try the Bistro in the lower level. I can confirm that the Bistro serves just as tasty a meal as the formal dining restaurant. It also had an amazing private room for a group of eight. The Bistro is just outside the arcade, (yes an arcade). Aaron and I can get quite competitive so we worked off our dinner shooting hoops (I won), and playing air hockey (he won). After our meals were settled, we headed to the hot tub, near the beautiful pool area. And, honestly, if it wasn’t so bad for you I would have stayed there our entire trip. To top off our relaxing evening, we brought out our magazines and read by that beautiful three-story fireplace. How could we resist not spending just a little more time by this amazing feature? After all that fresh air and relaxation I was ready for bed. Our room had the most comfortable king bed I have ever slept in. Day two started with Montebello’s famous breakfast buffet. I wasn’t quite sure why it was so famous until we started eating. You can pretty much get whatever you would like, including the Montebello crepes, (special little rolled crepes with their own maple syrup). Everything we had was delicious! We then took another little walk around the building, Aaron still couldn’t get over the log architecture and wanted to take one final look. Next, we headed for the dog sleds. Full disclosure, I wasn’t as excited to get on the sleigh as I was to pet the dogs. While I was petting the dogs our sleigh driver gave us a little history about dog sledding in the Petit Nation region (that includes Montebello), I won’t say more than that because her story was quite good, you should hear it yourself. The sleigh ride was about 15 minutes and was a tour of the wooded area around Montebello. We came back red-cheeked and ready to skate. There are two rink options for skating at Montebello, one strictly for skating and one for hockey. We chose the hockey rink because my husband used to play professional hockey, and because I still need the stick to hold me up. We had a blast at the rink passing the puck. We also wanted to try snowshoeing. I had only tried in high school gym class, and Aaron had never tried. The woods are so beautiful this time of year that it was certainly worth the time! Even though we were only at Chateau Montebello for less than 24 hours, we packed in a full schedule. There is a lot to do with the Resort Fee (an extra $25). It includes things like access to 42 km of groomed cross country trails, two outdoor rinks, hockey sticks and pucks, and all the equipment you need to participate in the winter activities. And, if you can believe it, there is even more to do in the summer! Here is the best part. Château Montebello is part of a new program from the National Trust. 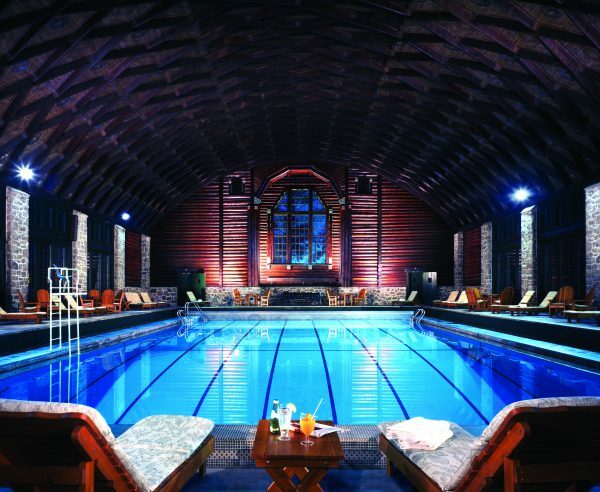 As a sneak peek special, members of the National Trust will receive 15% off the rate of the day at Chateau Montebello when you use the promo code NTCV. Stay tuned for more Vintage Destinations and discounts as the National Trust launches our new Network this Spring.